The classification of mangos must be considered from two distinct standpoints. First, there are numerous seedling races; and second, there are horticultural groups of varieties propagated by grafting or budding. The seedling races have not been studied in all parts of the tropics. Most of those in America are now fairly well known, but they are probably few compared to those of the Asiatic tropics. The latter region has not been explored thoroughly. So far as known, all the seedling races are polyembryonic. Individuals reproduce the racial characteristics with remarkable constancy. Numerous writers have said that these races (incorrectly termed varieties) come true from seed, and that there is no need of grafting or budding. There is enough variation among the seedlings, however, to make some of them more desirable than others. When one has been propagated by budding or grafting it becomes a true horticultural variety. The classification of mangos has been discussed by Burns and Prayag in the Agricultural Journal of India (1915); by P. H. Rolfs in Bulletin 127, Florida Agricultural Experiment Station; and by the author in the Proceedings of the American Pomological Society for 1915 and 1917. Plate VII. Red mombins on the tree. The abundance of grafted mangos has led Indian investigators to neglect the seedling races. Doubtless some of the horticultural groups of grafted varieties represent seedling races. C. Maries, in the Dictionary of the Economic Products of India, grouped the named varieties with which he was familiar in five "cultivated races." Probably some of these represent seedling races. The antiquity of its culture in India and the extensive employment of vegetative means of propagation have placed the mango on a different footing from that which it occupies in regions where it has been grown relatively a short time and propagated principally by seed. In India, the horticultural varieties are most prominent; elsewhere, seedling races (see definition of a race in the discussion of avocado races) are more in evidence. The mangos of the Malayan Archipelago have been less thoroughly studied, from a pomological standpoint, than those of any other region. The botanist Blume (Museum Botanicum Lugduno-Batavum) viewed them botanically, and described as botanical varieties a number of forms which are in all probability analogous to the seedling races of other regions. In addition to races, there are a number of distinct species of Mangifera in the Malayan region which bear fruits closely resembling true mangos. These must be studied in connection with any attempt to straighten out the classification of horticultural or pomological forms. Cochin-China appears to be the home of a race of mangos which is unusual in character, and which is certainly one of the most valuable of all. This is the Cambodiana. By some botanists it is considered a distinct species of Mangifera. It seems to be identical with the race grown in the Philippine Islands. The latter has been carried to tropical America, where it is known as Manila (Mexico) and Filipino (Cuba). David Fair-child, who studied this race in Saigon, Cochin-China, and introduced it into the United States, describes it as a mango of medium size, yellow when ripe, furnished with a short beak, and having a faint but agreeable odor. The flesh varies from light to deep orange in color, and is never fibrous. The flavor is not so rich as that of the Alphonse, but is nevertheless delicious. One of the plants grown from the seed sent to the United States by Fairchild has given rise to the horticultural variety Cam-bodiana, now propagated vegetatively in Florida. "There are three very distinct types of mangos in the Philippines : the Carabao, the Pico (also known as Padero), and the Pahutan, in some districts called Supsupen and Chupadero. The Carabao is the mango most esteemed and most generally planted." 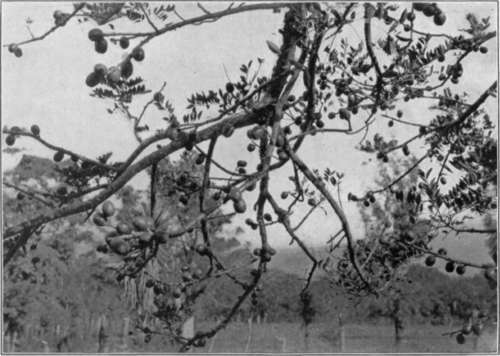 He further says, "Although uniform as types, there is considerable variation in the form and size of the fruit and presence of fiber and size of seed in both the Carabao and Pico mangos, and careful selection will not only bring to light varieties much larger than the average fruit of these types, but also those having a much smaller percentage of fiber and seed than the average fruit." The seedling mangos of the Hawaiian Islands have been given some attention by Higgins. In Bulletin 12 of the Hawaii Agricultural Experiment Station he describes a number of them. Judging from his illustration, the Hawaiian Sweet mango is the common seedling race of the West Indies. The French island of Reunion is said to be the source of several seedling races which have been introduced into tropical America. Paul Hubert 1 says the mango has become thoroughly naturalized in this island. He mentions thirteen varieties which are the most common; the names of several are the same as those of well-known varieties in the French West Indies. 1 Fruits des Pays Chauds. Little is known of the mangos cultivated on the African coast and in Madagascar. The seedling races of Cuba and those of Florida are practically the same, seeds having carried from the former region to the latter. The principal race is the one known in Cuba as mango (in contradistinction to manga, the race second in importance), and in Florida as No. 11. This is the common race of Mexico and many other parts of tropical America. For convenience it may be termed the West Indian. The tree is erect, 60 to 70 feet in height, with an open crown. The panicle is 8 to 12 inches long, with the axis reddish maroon in color. The fruit is strongly compressed laterally, with curved and beaked apex. It is yellow in color, often blushed with crimson; the fiber is long and coarse, and the quality of the fruit poor, although the flavor is very sweet. The manga race of Cuba is less widely grown in other regions, although it is well represented in Florida. The tree is spreading, 35 to 40 feet high, with a dense round-topped crown. The panicle is 6 to 10 inches long, stout, pale green in color, often tinged with red. The fruit is plump, not beaked, yellow in color, with long, fine fibers through the flesh. Two forms of this race are common, manga amarilla and manga blanca. The former, known in Florida as turpentine or peach mango, has an elongated fruit, deep orange yellow in color, with bright orange flesh. The latter, known in Florida as apple or Bombay mango, has a roundish oblique fruit, bright yellow in color with whitish yellow flesh. The Filipino (Philippine) race probably reached Cuba from Mexico, and thence was carried to Florida. It is the most delicious and highly esteemed of seedling mangos in all of these regions. Indeed, it ranks in quality with many of the choice grafted varieties from India. The tree is erect, 30 to 35 feet high, with a dense oval crown. The panicle is 12 to 24 inches long, pale green, sometimes tinged with red. The fruit is strongly compressed laterally, sharply pointed rather than curved or beaked at the apex, lemon-yellow in color, with deep yellow flesh almost free from fiber. In Florida there are comparatively few trees of this race. In addition to the above, there are several other races of limited distribution in Cuba. The biscochuelo mango of Santiago de Cuba is an excellent fruit, worthy of propagation in other regions. The mango Chino of the Quinta Aviles at Cienfuegos (a remarkable mango orchard established years ago) is a large fruit always in great demand in Habana markets. It is not, however, of rich flavor or fine quality. Manga mamey, also of the Quinta Aviles at Cienfuegos is of better quality than mango Chino, but is not so well known in Habana. In Jamaica the No. 11 race is esteemed above most other seedlings. It had its origin in one of the grafted trees found on a captured French vessel and brought to the island in 1782, as related on a foregoing page. The seedling races of Porto Rico have been treated in detail by G. N. Collins 1 and more recently by C. F. Kinman. The most prolific and popular race is known as mango bianco. The mangotina is found near Ponce; it is rather inferior in quality. The redondo is a seven-ounce fruit, lacking in richness. The largo has a small oval fruit with much fiber. The name pina is applied to several distinct forms, the commonest being a long fruit of inferior quality. None of these Porto Rican forms seems to merit propagation. In Mexico the principal races are the common West Indian, and the Manila or Filipino. The latter is grown principally in the state of Vera Cruz. Its culture should be extended to other parts of the country, as well as to other tropical countries where it is not now grown. 1 Bull. 28, U. S. Dept. Agr. There is one race in Brazil which is of exceptional value. This is the manga da rosa (rose mango), grown commercially in the vicinity of Pernambuco and to a less extent at Bahia and Rio de Janeiro. While frequently propagated by grafting, it is polyembryonic and should come true to race when grown from seed. It is heart-shaped, slightly beaked; and of good size. Its coloring is unusually beautiful. The fiber is coarse and rather long, but not so troublesome as in many seedling races. The flavor is rich and pleasant. This mango is believed to have been brought to Brazil from Mauritius. The espada race of Brazil is of little value : its fruit is slender, curved at both ends, green in color, and of poor quality. The horticultural varieties of the mango are numerous. C. Maries reported having collected nearly 500, of which 100 were good. Many of these were, however, of limited distribution and little importance. More recent Indian writers catalog from 100 to 200 varieties. The author has published in the Pomona College Journal of Economic Botany (December, 1911) a descriptive list of about 300, which includes the best-known from all parts of the world. Some of these, however, are probably seedling races, not horticultural varieties propagated by grafting or budding. Many writers have made no distinction between races, in which the seedlings reproduce the characteristics of the parent, and varieties, which can be propagated only by vegetative means. The confusion which involves mango nomenclature in India is rather appalling. There can be no doubt that in numerous cases the same name is applied to several distinct varieties, and it is equally certain that one variety in some instances has several different names. In addition, some of the kinds catalogued by Indian nurserymen probably never existed outside of their own imaginations. There are only a few varieties which are well known and highly esteemed in India. Most of these have been introduced into the mango-growing regions of the Western Hemisphere by the Office of Foreign Seed and Plant Introduction of the United States Department of Agriculture. The varieties described in the following pages are the best which have been tested in Florida up to the present. Most of them are well-known Indian sorts. They are few in number, but it is not possible to include in such a work as this a fully complete list. The classification here made into groups based on natural resemblances throws related varieties together and should aid the prospective planter to gain an idea of the more salient characteristics of each. Only the most important varieties in each group are described.